At the same time, the ‘Mercedes-Benz Fashion Week Madrid’ (MBFWM) takes place at the Feria de Madrid (IFEMA), 40 minutes by metro and 20 minutes by car. It started this Thursday and is its 66th edition. There, the main fashion brands, in 47 fashion shows, will present until Tuesday their new collections for the Fall-Winter 2017 season. “We are holding the Madrid Fashion Week and we want to show the other side of this fashion. 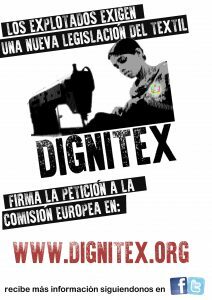 There are many cases of exploitation, slavery and even the use of children made clothing, “says Callao Juan Sabin, who belongs to the group Dignitex , a movement that aims to fight” for the dignity of jobs in the textile industry. In addition to presenting the performance , activists hand out flyers to passers-by. They insist on showing “the hidden face of fashion”. DIGNItex is made up for human rights and political organizations. In addition to Juan Sabín, who belongs to SAIn party, there is Lola Sánchez MEP from Podemos. “It’s the turn of the European Commission. It is them who must take the step to expedite this legislative process so that one day we see a law that is binding “and establish working conditions to avoid slavery in the textile industry. Caldentey argues that “voluntary initiatives” are not going to solve this problem. Despite having answered an e-mail, the answer is based on environmental protection but it does not affect the protection of workers’ rights or their conditions. It points out that Inditex is a “toxic free” industry that is constantly looking for “improving its supply chain” . “Our suppliers and their associated factories must comply with minimum requirements in the management of chemicals if they wish to work with us,” they say. It also says that they apply “improvements at every stage” of their value chain to reduce their “energy consumption” because they care about Climate Change.